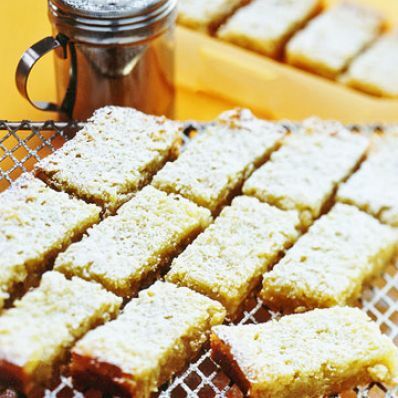 These luscious bar cookies feature a gooey coconut layer spread over a buttery almond crust. 1 of 1 Heat oven to 350 degrees F. Line 13 x 9 x 2-inch baking pan with nonstick foil, extending over short ends. 1 of 2 Place flour, almonds, sugar and salt in medium-size bowl. Cut in butter with pastry blender until mixture is crumbly. Place in prepared baking pan; with floured hands, pat into an even layer. 2 of 2 Bake at 350 degrees F for 20 minutes or until edges begin to color. Remove from oven to wire rack; leave oven on. 1 of 2 Sprinkle half the coconut over crust. Whisk together sugar, flour, eggs and juice until blended. Pour into pan. Sprinkle with remaining coconut. 2 of 2 Bake at 350 degrees F for 30 minutes more or until top is set. Cool in pan on rack. Refrigerate to chill. Loosen sides of bar with small knife; using foil, lift bar out of pan. Slide bar off foil with spatula. Dust with confectioners sugar.